1916 built for Northern Steam Ship Company. 1935 sold to K.D.V. Boxes. 1936 owned by M.S. Scott, Auckland. Converted to motorship and renamed HOKITIKA. 1936 sold to Eclipse Shipping Company, Auckland. 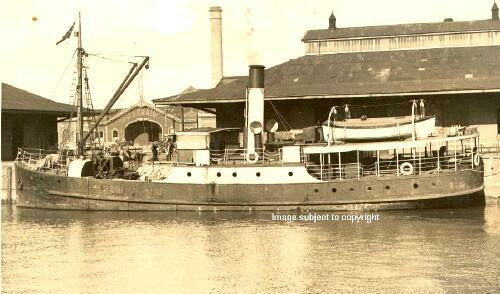 1941 sold to Anchor Shipping & Foundry Company of Nelson. 1942 sold to N.Z. Government for U.S. Navy employment in the Pacific. 1945 sold to Aspden Shipping Co. Ltd., Auckland for use as a cement carrier. 1954 sold to E. Savoie of Noumea and renamed COLORADO DEL MAR. 1954 sold to Establisements Ballande, Santu, New Hebrides and renamed HAVANNAH. 1959 sold to Wide Bay Syndicate, Maryborough, Australia. 1960 sold to Blue Pacific Charter Pty of Brisbane and renamed BLUE PACIFIC. 1965 sold to H.C. Williams of Rarotonga and renamed HAVANNAH. No further news. Please Email us if you can have more information.